All images in this post are affiliate links to the product. I hope that everyone had a great Christmas, and that you have enough space in your house for all the toys your relatives bought for your little cubs! I know that we had to do a lot of rearranging to get things to fit. One of the cool toys that Little Cub got for Christmas was the Fisher‑Price Laugh & Learn Smart Stages Piggy Bank. She really loves playing with this toy, and has gotten a lot of use out of it in the last week or so, so I thought it would be a good one to review for other moms out there! 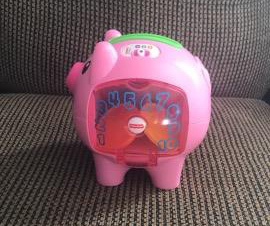 This Smart Stages Piggy Bank doesn’t contain a lot of features, but it gets the job done if you are looking to teach your little cubs how to count, and also some 2nd language skills at the same time. The bank comes with 10 coins that your kid can put in the slot, and the bank counts them out loud as they go. Once you reach 10, the piggy bank starts singing a song about the coins and counting, which is a nice little reward for them getting all the coins in the slots. For Stage 1, the piggy just counts in English, and Stage 2, the piggy counts the coins out in English, and then Spanish right after to help with learning the translations for numbers 1 through 10. The nose of the piggy bank is a button that makes the pig sneeze, or say a couple short phrases. 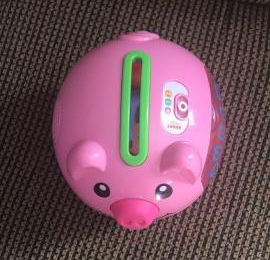 The item description on the Fisher-Price website claims that this little piggy has 40+ songs and phrases that it says and sings, although that seems like it may be exaggerated. It is also cool that, in the theme of teaching kids basic words, the pig says “open” and “close” when you open and close the door. It’s nice to have this added feature for extra learning! While there are a lot of good things about this toy, it has a drawback. The main drawback of this toy is that it starts recounting the coins if you wait too long to add another one. And I’m not talking about 10 minutes. 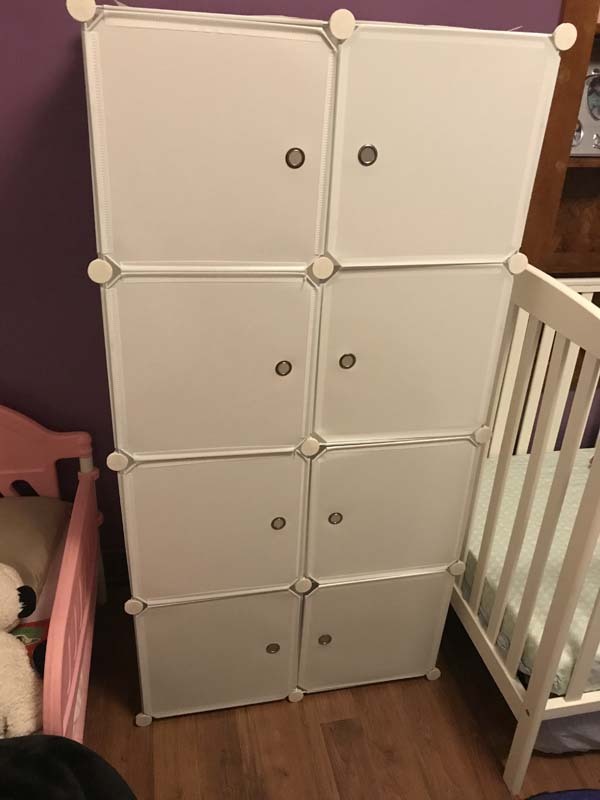 My Little Cub is only 16 months old, and it sometimes takes her a few tries to get the skinny coin up to the skinny slot and pushed inside. I haven’t timed exactly when it restarts, but it has to be less that 2 minutes. Sometimes, by the time she gets another coin up and to the slot, the pig starts back at 1. This is an issue for me because she loves music, and the child gets rewarded with a song when they put all 10 coins in. The song only happens if the piggy counts up to 10. There have been times when she has gotten 8, and was set back to 1 for “waiting too long”, and didn’t get her song. The cheat for this is to take one of the remaining coins and trigger the switch 8 times and let her continue, but this can become a burden. It is important to note that pushing the nose during a counting cycle will reset the pig’s count also. Since babies love buttons, this is a problem as well. Despite the issues with the counter resetting, Little Cub loves this piggy bank toy. She loves clapping when she gets the coin in the slot, and looks at us to clap and appraise her as well. 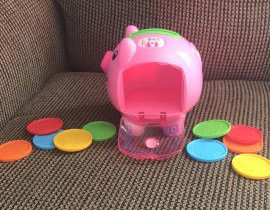 It has helped to fine-tune her fine motor skills as the coins are thin, as is the slot, making it hard, but not too hard for baby to get the coin inside piggy’s belly. The few songs that it has are fun, and Fisher-Price seems to shell out some pretty solid toys overall. Given the many good and one bad aspects of this toy, My rating is a 4 out of 5. 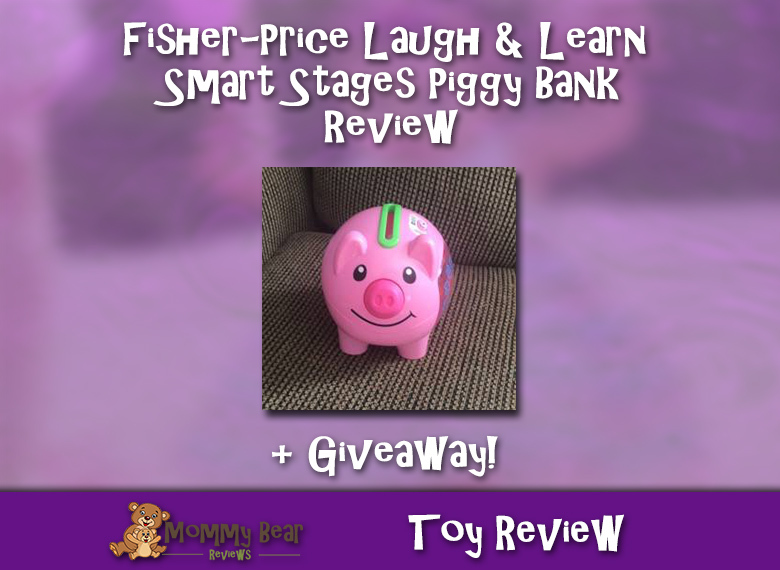 Fisher-Price Laugh & Learn® Smart Stages™ Piggy Bank Giveaway! Since Little Cub loves this toy so much, I’ve decided to do my first giveaway! It has been hard to find this toy online, but I’ve located one and bought it for the giveaway! It will be here next week, and I am so excited! Most online sites are just out of stock. Others, like Amazon, have this toy listed by 3rd party sellers for as high as $59! Rest assured I have a piggy on the way! Help teach your little cub counting and a little Spanish! Enter the contest below for your chance to win! Laugh & Learn® Smart Stages™ Piggy Bank Giveaway!